Pet urns are for the cremated remains of pets. These custom pet urns are made from solid red alder wood and are available in two sizes, small for cats and small dogs, and large for large dogs. To place the ashes inside the urn, flip over the box and the bottom unscrews from the top box portion. The wooden top of the urns can be personalized with engraved text only, such as your pet’s name, birth and death dates, or a personalized quote. It can also be engraved with a picture of your pet as well. 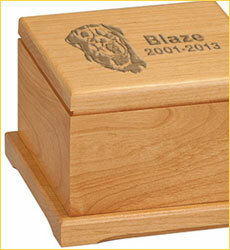 Both the large and small wood pet urns are also available with a full color, sublimated tile insert. This tile can feature a picture of your pet as well as some text. You can upload a color photo of your pet and the photo along with your personalized text will be sublimated into a tile that is mounted into the lid of the urn. 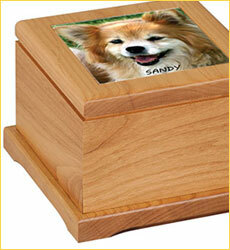 You can upload a photo of your pet that will be engraved along with your personalized text onto the wooden top of the urn. No photo is included with this option. 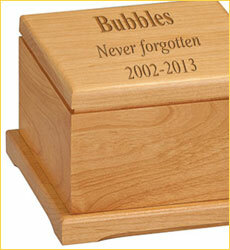 You specify the text you want, the style and font, and we will engrave it onto the lid of the urn. Stephanie with customer service was AWESOME!!! I really was under a tight time crunch and Quick Trophy lived up to its name and got my order out within 24 hours of my placing it! I also had a concern about the shipping and she kept me updated and informed about the shipment's progress. Above and beyond service! Thank you! 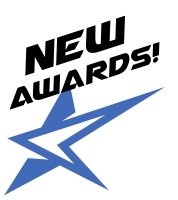 Will use again for all our trophy needs! The kids loved their t-ball trophies! I really liked these trophies. We always order from here when it comes to end of year ceremonies. ive ordered many times (more than 6) with this company and the service and product is always flawless. shipping is a bit expensive in my estimation but other than that, its all good with Quick T.